1. 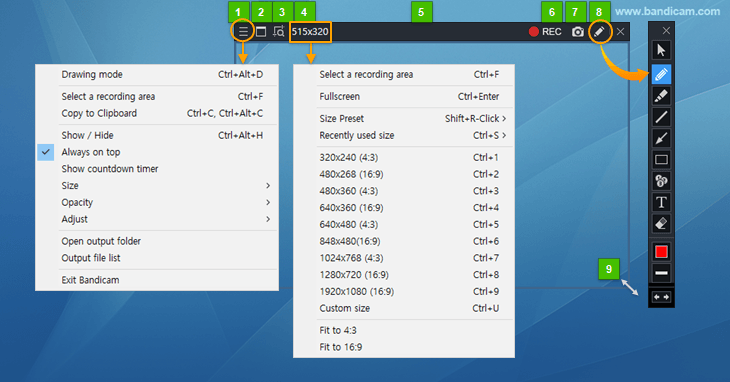 Bandicam is now able to copy a screenshot to the clipboard with a hotkey (Ctrl+C or Ctrl+Alt+C). 2. The maximum video resolution for AMD VCE H.264 encoder has been changed from 1920x1080 to 4096x2160. 3. The term of the hardware-accelerated encoder for AMD has been changed from AMD APP to AMD VCE. 4. Improved Bandicam execution speed. 5. Bandicam now displays an error message if the 'Set timer for Auto Start Recording' option is checked while the recording mode is not selected. 6. The drawing tool now moves together with the rectangle window. - The cursor tool in drawing mode didn't work in the full screen recording mode.